As you have probably heard countless times in your life, water is life. This fluid is what we are mostly made of, so we need constant supplies of it in order to function properly and live. The very fact that we might survive for weeks without food but may die in only a day or two without water serves to emphasize this necessity of our regular water intake. Water is in charge of many of our bodily processes some of which are blood circulation, waste removal and regulation of bodily temperature. Thus, you need to have enough water in your body in order to make sure these, and many other things are in control and that you yourself are healthy. Of course, you are always advised to be creative, since, beside direct water, you might satisfy your thirst by eating fruit, or by drinking natural fruit juices. However, at the end of the day, water in its original form will be all you need for staying healthy and fresh. But, how much water does an average person need? One of the best ways to calculate your daily intake of water is to multiply your weight by 0.5, since for every pound in your body, you need an ounce of water. Once you get this value, all you need to do is divide it by eight, since you need to spread this water intake throughout the day, divided in cups. The result will be your ideal water intake during the day, in ounces. It will probably range from 8 to 12 cups a day. If you pay attention to the calories you insert in your body, you might use the following method also, just multiply 0.034 with the number of calories you ate. The rule is, for every calorie, you need 1mm of fluids. Of course, if you exercise, you lose more fluids and need to drink more afterwards. What is more, you also lose sodium, so you might include this element into your compensation once you finish exercising or even during it. Also, living in areas with high or low humidity, may and will influence your daily intake of water. Also, during the winter, while we are heating our dwellings, we lose more water than when this is done naturally. Pregnant and women who are breastfeeding need more water since they are giving more of it up in order to nurture their child. Finally, every time you are sick or suffering from infections of any sorts, you need to increase your intake of water, providing your body with enough fluids to fight these sicknesses off. What are the best drinks for FSGS patients to drink? Can I lose around 30 lbs in 5 weeks with my current weight loss program? 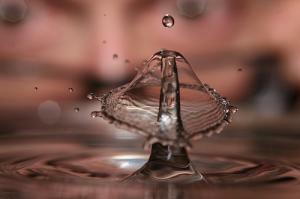 What Importance of water in Hemorrhoids Prevention? How To Prevent Recurrent UTI?